Holidays4u.org offers a selection of privately owned Self catering apartments on Victoria Court complex in Los Cristianos. This one bedroom apartment on Victoria Court II is one example. This one bedroom apartment is located on the 1st floor and enjoys a sea view and sunny balcony. 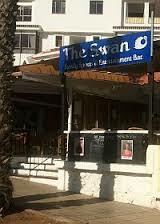 We would like to recommend the Swan Bar which is situated on Parque Margarita, opposite Cristian Sur in Los Cristianos. It is a small, family run, friendly bar, offering Karoake nights. The bar is very popular so make sure you arrive early to guarantee getting a seat. There is karoake most nights, and host singers who entertain everyone, including many regulars, and also a quizz is normally arranged mid-week. The beer is cheap and there is even a roof top terrace.